(From Pentax lens literature) The Pentax SMC P-DA 16-45mm f/4 ED AL is recommended for use with digital cameras. It features a 3X zoom ratio with focal lengths covering ultra-wide angle to normal ranges, incorporates a high-refraction extra low dispersion (ED) glass element to produce a high-resolution, high-contrast image with true-to-life color rendition, and aspherical lens elements to help transmit the light more efficiently through the lens to the film. The SMC P-DA 16-45mm f/4 ED AL is well-suited for advanced amateurs and professionals. a good lens, in terms of quality of images produced, though it's not on a "wow" side. It's a good "upgrade" option from the kit lens (18-55), but it's a bit overpriced in my opinion. It has quite an unusual focal range. This quite nice lens is sharp, speedy at AF and feels nice in the hand. IMHO it's better than the 16-50 SDM, because of the faster AF. It's well known that the SDM-Motor will live 2 years and then you'll need a new. The only prblem here could be that there is a flash shadow using the internat flsh (I don't do so...). This lens is fantastic, it is the "must have lens" on the K10 and the k20. Really spectacular. I think the only reasonable alternatives are the new tamron and Sigma but they lacks in colour and aren't 16mm! This is a significantly better lens compared to the Pentax 18-55 kit lens, which itself is pretty good for a kit lens. Quite good optically except for chromatic aberration correctable in Photoshop. I bought this lens on eBAY noting it was supposed to have been used only a couple of times. When received, it was in like new condition. I have only had this lens for a couple of weeks at this writing and so far I like it very well. Like many users have noted, I have also found the fact that the barrel extends fully to reach widest coverage, backwards of many designs, to be a slight hinderance. In doing so, the built in flash on the K10D is obscured at the wide end of the lense's coverage, creating a dark shadow in the foreground of the image. Since this is actually a 'J' lense, there is no aperture ring so this lense cannot be used in a manual setting mode. The images produced by the DA16-45 are of very nice quality and appear sharp in the samples I have shot so far. I also have the DA18-55 kit lense and the DA16-45 is much better than it. I have not noticed any of the CA fringing reported by others but so far as I haven't shot any scenes where it is reported to occur. The hood is massive and fills the slot in my camera bag fully so keep that in mind if your bag is smallish. The feel of the operation is smooth and the overall size and weight of the DA16-45 complements the K10D very nicely I think. If it were not for the reversed barrel extension on the wide end and lack of an aperture ring for manual settings, I would have probably rated this lense a 10 overall. 16mm wide angle, Constant F/4, Nice Bokeh, minimal Distortion, Good Flare control. Slow AF in low lighting. Noisy Auto focus. awkward extended rotation to achieve wider angle. This truly a great piece of lens, consider getting this lens with the K10D body instead of the kit lens. You get much wider angle at 16mm and constant F/4. I tried several close up shots even though this lens wasn't meant for close ups it still produce great sharp quality image and nice bokeh. Sharpness and color reproduction are great. Contruction feel is good and doesn't feel really cheap. Great control over flare, minimal distortion even at 16mm, corner darkness isn't a problem. Can use circular polarizers and petal hoods. Sad points about this lens that it focus slowly in low light and take quite a while to focus. Auto Focus quite noisy and the way the lens is extended to get 16mm instead of the usual way around. Those are the only cons about this lens. This lens is highly recommendable and should be bought without any doubts! A No Brainer considering the price for this lens which produces much better image quality and sharpness. It's a steal. Ok this lens is great kit lens. - Feel good construction quality. flash it can create lens shadow. but I still recommend to all this lens coz for outside pictures and all around lens its a good above average lens. Sharp pictures... !!! This is my main lens and covers my favorite ranges. it gives really good quality images and has a nice grippy zoom ring. Like most modern lenses it's a little too plasticky feeling for my tastes, but seems well made. 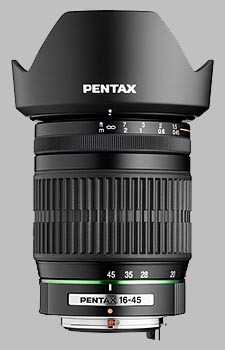 This is a must have lens for any Pentax users. It is a very sharp lens with an excellent wide angle zoom range. Flare is VERY well controlled as well, this lens easily has the best flare performance of any lens I have used. The only complaint I have is that the the front element extends outward when you zoom OUT. this is annoying when you are trying to get a wide angle close up of people because you literally need to shove the lens inches away from their face. Overall I highly recommend this lens to anyone looking for something better than the kit lens that comes with their camera. Very Sharp, smooth zoom and manual focus. When at 45mm the lens is at its shortest physical length. When at 16mm, the lens is at its longest physical length. For those using the internal flash, it does leave a shadow at the bottom of the image. Although the focus ring is at the front of the lens, it does not rotate when focusing. Circular Polarizers and Gradient Filters, as well as the included lens shade, work just find with the lens. Front element rotates when focusing, so you need to watch it with a Polarizer. This is a much better choice for the Pentax pro digitals than the kit lens that is usually bundled. It's a constant apeture zoom, and stays sharp even when opened wide. The front element seems to revolve as the lens focuses, so you'll need to double check when using a polarizer.